Everyone loves a deer head in their house! Measure 4″ up from bottom of your foam. I only made 4 cuts total so I ended up with 6 strips of foam. 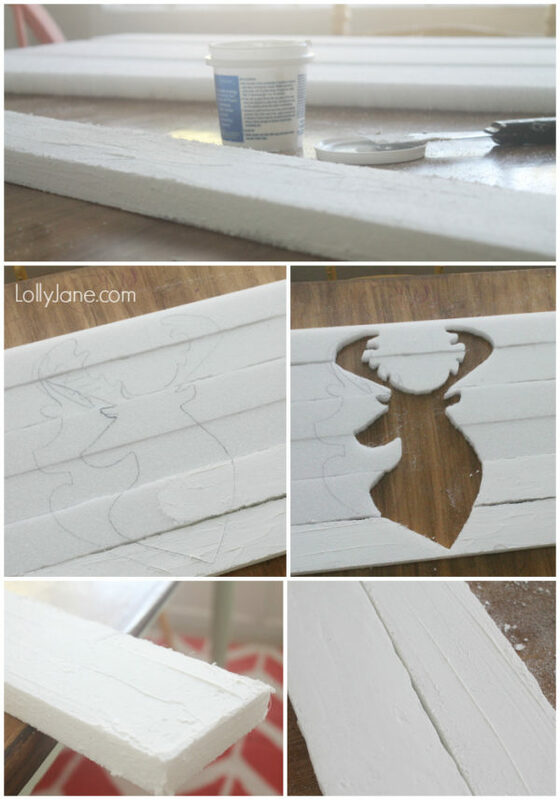 Trace a straight line down the foam so you can easily cut it in the next step. Cut your foam with the Styro Cutter tool. This is an awesome helper! It melts the foam for you, very little work!! I love love loved using it! Just follow your straight line, the tool does all the work. Note: If you don’t want to buy the tool, you can use their cutting tools shown above as well. It’ll take longer and you’ll use your muscles but it’ll will work just as well. I google image searched for a deer head I liked then used a Sharpie to copy it onto the foam. As you can see, I messed up a few times which is okay since you’ll be painting soon anyhow. 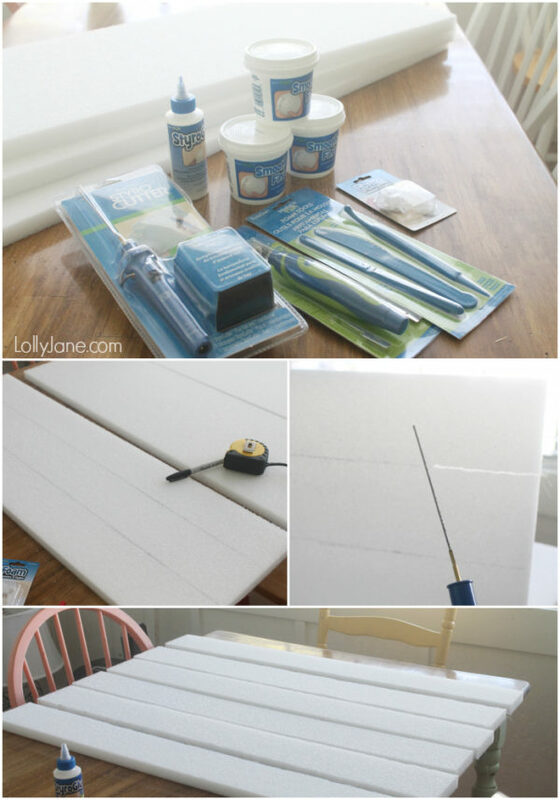 Next, coat your strips of foam with a putty knife and a lot of the smooth finish. 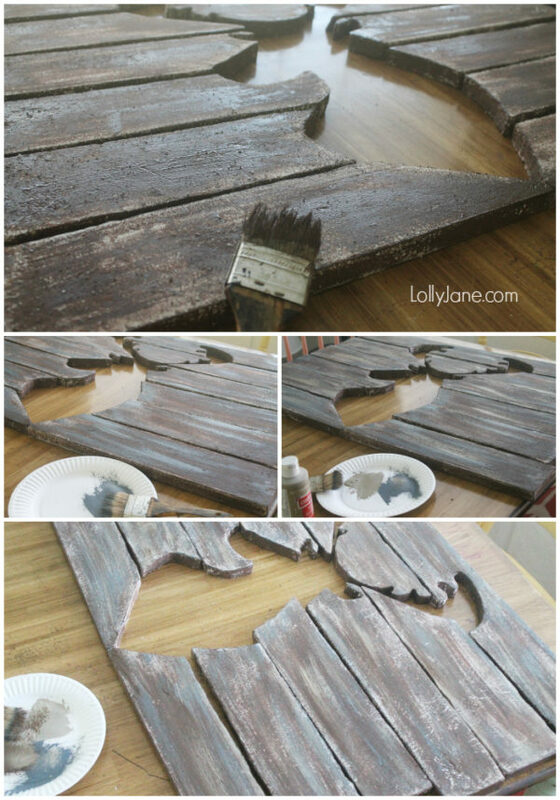 Give yourself a couple hours for it to dry, this project literally took me the whole 6 hours my kids were at school to finish…in between laundry and mopping floors of course (; Make sure to coat the sides but don’t worry about the backside. Sand it down till it’s smooth. I used my mouse sander which did a beautiful job! Notice on the lower left corner (above) the difference between sanded and unsanded, you’ll definitely want to sand! This is the fun part: painting! Paint your base coat chocolate brown, don’t worry about coating it 100%. Don’t forget the sides! Dry brush a layer of gray on top, using your rinsed out brown brush, after it’s dry of course. Using the same unrinsed gray brush, add some tan where you feel like it’s too dark or too much of one color. Using the same unrinsed brush again, add some of your original brown until you like the final look. After everything is dry, connect your foam pieces together using the connectors. Optional: Using the Stryo glue, glue in between slats for added strength. Optinal: I also used greening pins to secure the backside since my kids may tug on it occasionally. It’s ridiculously sturdy! Push the eyelets into the backside (or top) to hang easily using bakers twine! I added a quick pom pom bunting to mine using fall colors. It’ll be fun to swap out colors for different holidays. Are you getting the pallet art bug?? Check out more fun of them at Crafts n Coffee, plus even more inspiration at MakeItFunCrafts.com! 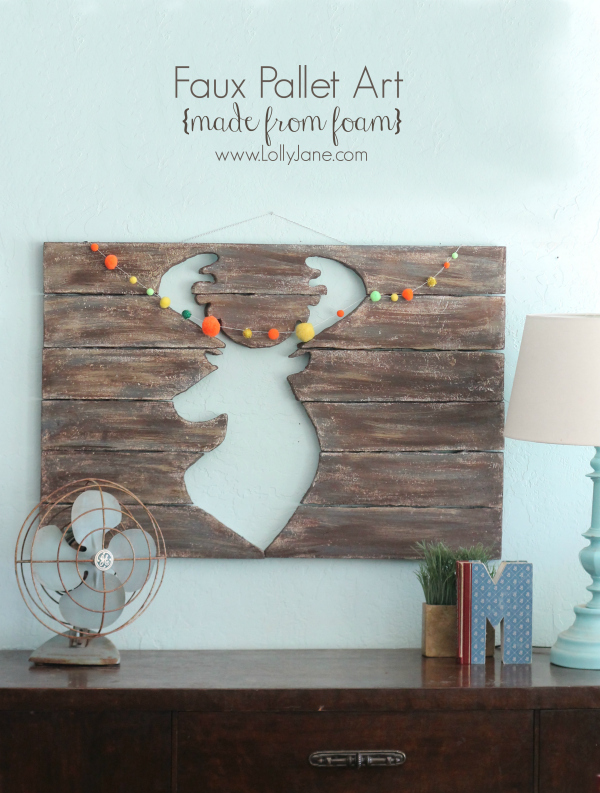 Check out all our DIY projects and fall/autumn decor too! This is gorgeous! Your paint job is incredible and it looks so real. Love the pompom garland, too. Thank you! On first glance, it really does look like wood! I noticed the techniques you used, though, from my theatre major days. I did plenty of painting old wood techniques. It looks really great, though, and I love the pom pom bunting! I can’t believe that’s not real wood! This is so cute! Great job! This is so cool! 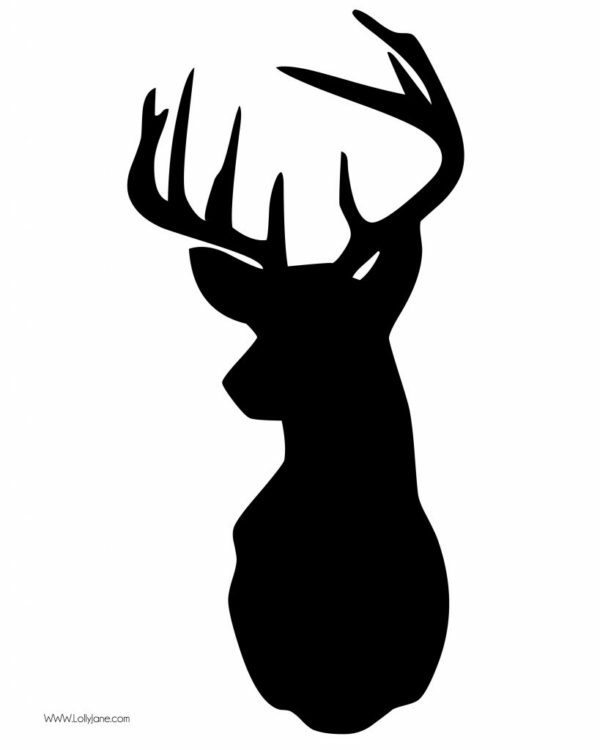 I love the deer silhouette! 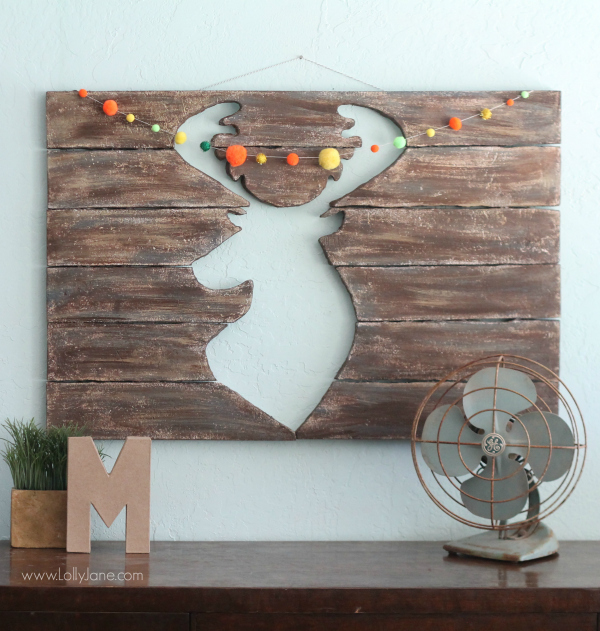 LOVE this faux pallet art, and the deer head is perfect!!! What a clever idea!! I’m loving this!!! 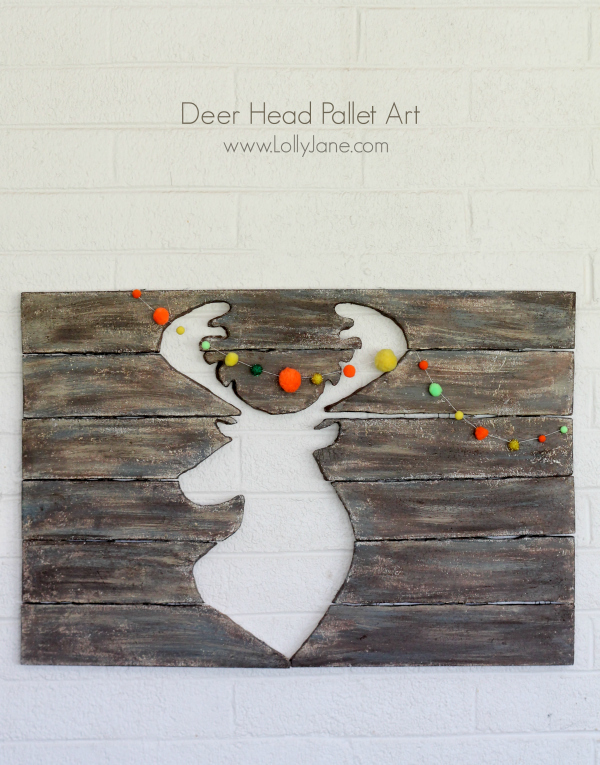 I love the deer head pallet art!! We used to have three actual deer heads from my husband and daughter’s hunting adventures. When we downsized, we had to let me go, but we took many pictures to remember them. This is so awesome. Where did you buy everything? Im guessing you went to the craft store and hardware, but just curious! Does the craft store have all of the floralcraft products? Wow, what a cool idea! And this will be so easy to hang on the wall (as opposed to those super heavy pallet things)! Cute! I just LOVE this. That is my idea of a deer head and about the only one that would hang in my home 🙂 GREAT JOB! 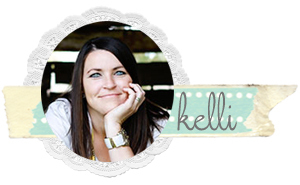 BTW- I finally got a post on about the Nesting Event. I loved going and wish I would be able to go to more however I have since moved to OR. Here is the post: http://www.salvagesisterandmister.com/craft-night/ although I was hoping the pics turned out better. Thank you for your inspiration and the deer head silhouette. I used it to make an ornament, and one day hope to make your beautiful artwork, too! What an awesome project!! No one would ever know that it was made out of foam! So clever! My gosh with all the deer head projects and any others yet to be discovered will be on here all night. Awesome blog. Are you twins?Dumb question? 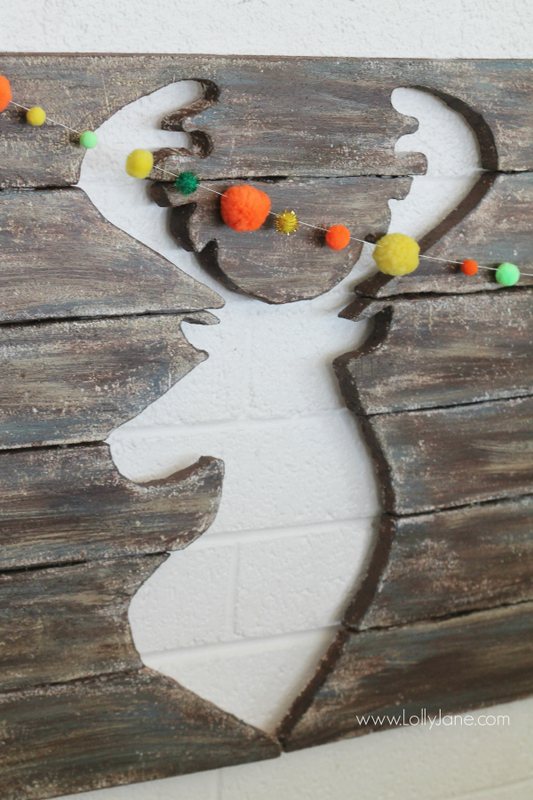 Thanks for sharing all the great ideas, will be fun to make some deer. Last year I had right shoulder replaced on Dec. 7th, so holidays were pretty tame at our house. What I got done before surgery is what was done. Actually was kind of nice not to be working on projects at last minute to get them done. Will try to give myself a break, not do too much again.